Grab a cuppa and enjoy the read! When and why did you decide to Home Educate? This is our fourth year of homeschooling. 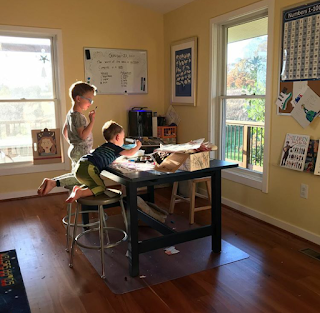 We pulled our son out part way through first grade to homeschool. There were a few reasons but possibly the most important was having extra time together as my husband was working away four weeks out of five at the time. What kind of approach do you take? 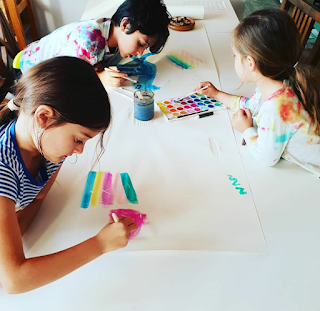 Our homeschool style can be summed up in three words; creative, holistic, eclectic. We draw most of our inspiration from Waldorf and Charlotte Mason methods. 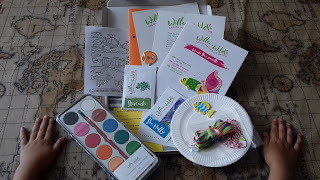 It looks like we're back to typical British weather this week as it's been pouring down for the past couple of days, so when the kiddies' personalised Willow & Wild box came through the post I was so relieved. The younger ones had been enjoying playing out in the garden everyday with their sand & water activities and now they're back indoors. Willow & Wild box has come through our letter box just at the right time! This month we will be sowing Sea Holly & Spinach, getting crafty with painted paper plate jellyfish (that's a tongue twister! ), getting out and about collecting nature 'treasures' and keeping a nature journal. We will also be completing the '28 days of nature-inspired activities', ticking them off on the little chart along the way! Grab a cuppa and have a read of our next Home Ed Q&A. Today we interview Sydney from the US. When and why did you decide to Home Educate? My oldest is 6, so I suppose I officially decided last “school year.” We have a great little charter school locally, but with it only having one class per grade and a waitlist, I wasn’t comfortable waiting to find out if he’d gotten in. I wanted to know what we were doing, so I made the final decision last summer and I’m so glad we did.